Sixty-six years old and this is what my life has come to. Most of our time these days is like the picture above, but the high drama continued with our former landlord who was in full loon mode on Friday. Brett messaged him on Friday to ask the status of our deposit. The landlord (LL) texted back that we had broken the freezer basket tracks and the freezer was “unusable” until it was fixed, and we would be charged for those repairs. The freezer basket worked fine when we left the house, the same way it worked the entire time we lived in the house – we told him we had a witness to its condition. Suddenly the refrigerator was still under warranty and there would be no charges for repairs. I had told Brett ahead of this that I was sure LL was going to claim we broke the oven and damaged the floors, and sure enough he did not disappoint. When we mentioned that the oven had been “unusable” for nearly two months before we moved out and he had not seemed in any particular hurry to get that fixed he outright lied and said he had had three “licensed experts” look at the oven door, and they had concluded it was impact damage that we had caused. He could have stopped there, but no, he went on to say they had saved the shattered glass as proof. Uh no – Brett had helped the one repairman who ever showed up throw the piece of broken glass away! So LL backed down to two “experts,” but we said if they had ever come and looked at the glass they did so when we weren’t in the house, which was a major violation of our lease, so the whole oven argument was also quickly dropped. Then he started in on the floors, saying they were a mess and we hadn’t stripped or re-waxed them or gotten rid of the salt damage. We reminded him for about the fourth time that we had it in writing from him not to do the floors before we moved out! It took some back and forth, but he finally backed off that as well. The arguments and accusations went for on for a couple of hours, with almost every text from him containing a new (supposed) violation or some personal wrong we had done to him. He told Brett at one point that he was just a poor, sick old man, an honorable man and a former Marine, and we were disrespecting and dishonoring him (he’s only two years older than Brett, who spent 22 years in the navy versus getting kicked out after a couple of years so you can guess how that went over with us). He said we hadn’t cleaned the house while we lived there according to his directions or methods so therefore the house was not clean! Also, apropos of nothing, he told us he thought we were friends because we had discussed doing a house swap with him between Texas and Hawaii! WHAT??? Anyway, at the end of all this he said we had been his best tenants ever and he had planned to give us back our whole deposit without even looking at the house (first time we heard this), but we screwed it up because we got angry when he stood us up last Sunday for the walk-through inspection. Everything, absolutely everything, according to him has been all our fault and we turned out to be nothing but a big disappointment. He said he is only going to mail a part of the deposit along with a list of all our transgressions, which we’ll believe if and when we ever see it. I have a strong feeling we’re going to be back on Kaua’i and in small claims court next year. The tax man will be coming for him in the interim though. 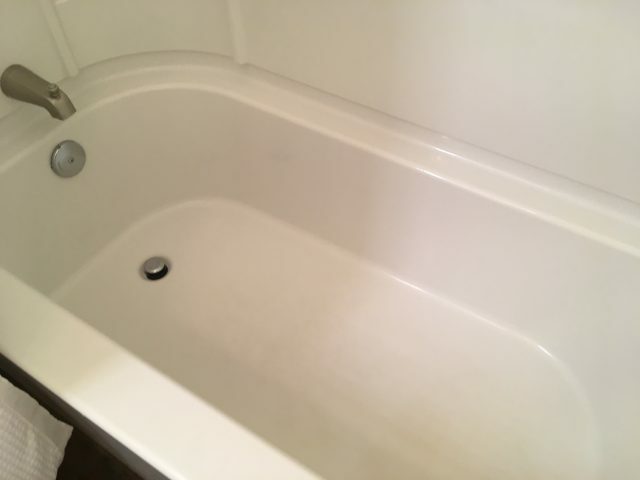 The landlord said he is going to have to charge us for the brown spot in the tub, but where is it??? I think he forgot we took LOTS of pictures, and had witnesses with us. We continue to enjoy all that the resort and our condo have to offer. 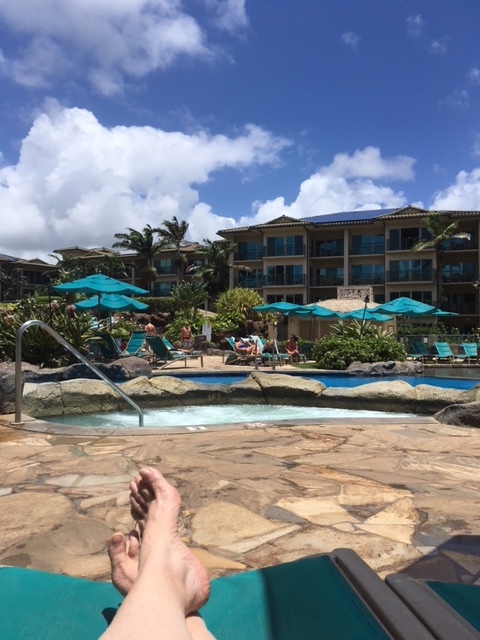 My favorite daily activity has been to soak in one of the hot tubs every morning for about 20 minutes, and then get some exercise in the pool. 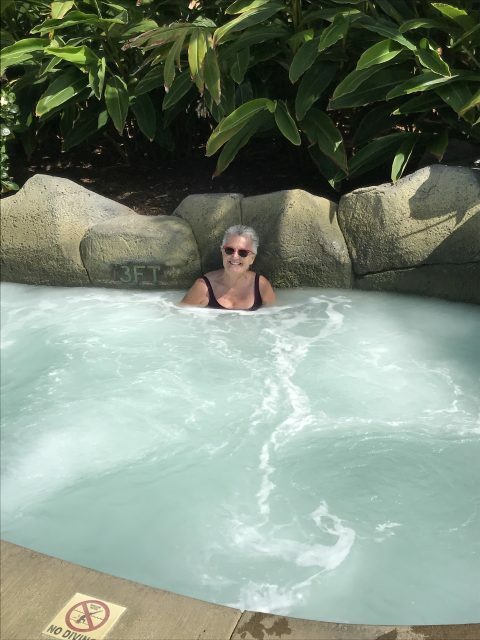 The hot tubs have a sandy bottom which feels great on my feet, and the temperature is wonderful – just at the point of being too hot when I get in but that I adjust to quickly. I love that I usually get the opportunity to chat with other visitors while I soak – I’ve met some very nice people this past week. And, I try to go down the pool slides every day. I keep telling myself I’m doing it for my grandson but the truth is I do it for myself because I LOVE pool slides and the ones here are awesome! The lazy river feature provides maybe too good of a workout – it feels like I’m carrying 50-pound weights on each leg as I walk back and forth. YaYu will have her wisdom teeth removed early tomorrow morning. We know that everyone’s procedure goes differently – I was laid up for a couple of days eating nothing but applesauce, ice cream and mashed potatoes while Brett was eating pork chops for dinner the same evening he had his removed – so we’re just going to play it by ear afterwards. We can easily get over to Safeway for whatever she needs or wants to eat. Reading: I am almost done with The Child Catchers. It’s been very thought-provoking, and at times has challenged some of my own thinking on adoption. I am still working my way through Our Towns. It’s very interesting, and my biggest take-away so far is that many people and places in the U.S. are not doing as badly as what gets reported. It’s reminded me of the old adage that a good story will only be repeated once while a bad one will be shared at least fifteen times. Listening to: Again, I am loving the peace and quiet here. I honestly had no idea how noisy our former neighborhoods were until we left: the chickens and roosters, loud cars, noisy neighbors, loud music, weed trimmers, saws and lawnmowers, and dogs barking were almost constantly making some kind of noise, even in the middle of the night. Yes, there were times when I could hear the breeze through the trees, and birds singing, and I sort of got used to the noise after a while, but it didn’t take long for me to appreciate how much I enjoy true peace and quiet. Watching: Although we have cable TV here, the only things I’ve been able to bring myself to occasionally watch are the Food Channel or HGTV, and only in very small doses. After only Netflix or Amazon or PBS for the past several years, the commercials drive me nuts now. I did enjoy watching Endeavour and the Great British Baking Show on a regular TV screen this past week versus my computer. Cooking/baking: I baked a cake yesterday! The condo came equipped with a cake pan, mixing bowls, and measuring spoons and cups, so I made a butter cake with a chocolate glaze (which used up the last of our expensive chocolate powder and confectioners sugar). We’re having grilled steak for dinner tonight, and I plan to make chili-pork burritos and Chinese stir-fired tomatoes with eggs some time this week. Otherwise I’m not sure what else we’ll be having. Happy I accomplished this past week: We took care of the last bit of banking we had to do here on the island, and will be ready to shut down our local account a few days before we go. We also got our VPN account set up – we needed one here at the condo and will need to have one as while we’re traveling. I otherwise accomplished nothing other than getting myself out to the pool every day because there was nothing else that needed to be accomplished! We officially transferred the Civic over to Alan and Cheryl this week, and are in the process of assembling a few things more to go to the thrift store but that’s the extent of our busy-ness these days. Looking forward to: Brett and I are going to look at our travel calendars, pick dates and start making museum reservations for Paris, Florence and Rome. Otherwise, I’m not looking forward to anything more than spending time by the pool. The weather wasn’t ideal last week (warm, but always a bit overcast) so hopefully we’ll have some more sunny days this week. Hurricane Hector is currently passing by and has brought wind and some rain, off and on, but the past couple of days have been lovely most of the time. 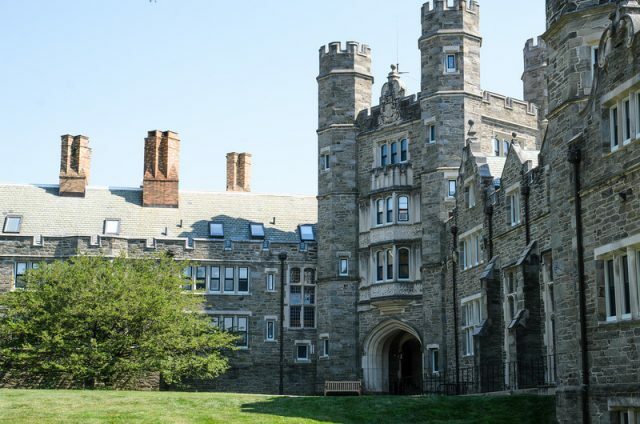 YaYu’s future dormitory at Bryn Mawr! Thinking of good things that happened: YaYu got her dorm assignment this past week and will be sharing what appears to be a quite small room with a girl from the Los Angeles area. They’re already chatting and getting to know each other, and we’re all anxious to see what the room looks like inside. The dorm itself is in a great location on campus though and reputed to be one of the most desirable. Although dealing with our former landlord this past week was aggravating (which is putting it mildly), we did get all of his lying, bullying, inconsistencies, etc. on the record because his whole tirade was done through texts (Brett has messages from him going back to early May). Brett has taken screen shots of everything and stored them, making it much easier for us if we do have to go to court. Otherwise, just being here at the resort has been a very good thing! Thinking of frugal things we did: Other than buying the few things we need from the grocery store we’ve been using up what we brought with us from the house, trying not to waste anything. Grateful for: I hurt my back the day before we moved out of the house doing who knows what, and am very thankful I can sit on the bench in one of the hot tubs, have the jets massage my back, and voilà! any residual morning pain is gone. I climb out of the hot tub feeling terrific and my back doesn’t bother me the rest of the day! Bonus question: What’s your favorite type of chocolate: dark, milk or white? Although I like dark chocolate (in particular, dark chocolate with orange) and it’s pretty much all I eat now, my favorite type of chocolate will always be milk chocolate. I don’t eat much of any type of chocolate these days, and when I do it’s almost always dark chocolate now, but I still prefer milk chocolate. I’m pretty particular about it too – my favorite milk chocolate comes from See’s Candy, but I also like Lindt and authentic Cadbury chocolate from Great Britain (and I adore Cadbury Creme Eggs). Godiva is only so-so in my opinion. Hershey’s used to make a thick milk chocolate bar with almonds that was fabulous, but they discontinued it several years ago for some reason and I still miss it. I don’t care for white chocolate at all, or even consider it chocolate. That’s a wrap for this week! How was your week? What did you accomplish? What good things happened for you? And most important, what’s your favorite type of chocolate? It will always be white chocolate for me, I’m afraid. I know that to the purists it is not the real thing, but I’ve never been able to resist it! I’ll don’t hate white chocolate, but I don’t seek it out. I do like to add white chocolate chips or broken bark to brownies sometimes (with dried cherries if I have them), but that’s as far as I go with white chocolate. There is also a candy bar called a Zero bar that’s coated in white chocolate which I like (especially when it’s frozen!). Ooh, have never thought of freezing white chocolate before. Will have to give that a try! Wow..that dude is desperate. He clearly has fleeced people in the past and can’t believe you’re pushing back. Good for you, but how annoying. Desperate exactly describes our former landlord. The next step is his, but we have all sorts of photos, texts, witnesses, and other documents to back us up. I heard from someone I know that is a long-time Hawai’i landlord and he says that landlords rarely win in small claims, and if he didn’t show up for a walk-through inspection his goose is cooked no matter what he claims. So we will see. I think Godiva used to be good but that was before they got “big” and overextended and started coasting on their name. There are so many smaller companies making better chocolate. In Portland our go-to for quality chocolate was Moonstruck but there were other local companies that were better than Godiva – even See’s is better. The hot tubs here are wonderful – there are three of them. Two for adults only and one that parents can use with their kids. The adult ones have hotter water and stronger jets. I’m with you on not realising how impacted sleep can be by a noisy situation. We moved to San Diego this week, and after 4 years – living at 4 different apartments in the Bay Area – we have recognised how the continual noise of fire sirens, trash collection, people yahooing on the streets resulted in serious sleep deprivation. Where we are now is so quiet, well mostly as there will always be people with big mouths who don’t respect neighbours, the past few nights I’ve been able to actually get through the night only waking once, whereas before I’d be awake by 3 am and done for the night. I am sleeping so much better here – not just because it’s quieter but because of the air-conditioning as well. We’ve been trying to figure out why there are no chickens or roosters here. They are EVERYWHERE on this island . . . except here. My hypothesis is that they consistently spray for bugs, so there’s no food here for the chickens and they stay away. Brett (jokingly) thinks they have low level electronic fences that keep them out. Whatever they’re doing it works and the quiet is pure bliss. So excited for you & Brett regarding your enjoyment of the condo and your anticipation of the Big Adventure! So sad your landlord has turned out to be so dishonest. Glad you have proof and witnesses. Wonder how many possible renters read your blog? And wonder if there is a place to leave reviews for him—-after the dust has settled. Ya yu will soon be starting Bryan Mawr and enjoying gorgeous fall weather. You & Brett have launched four wonderful adults into the world, such an accomplishment! Thank you for the lovely comment! We are getting very excited about our upcoming departure – just two more weeks before we go! We have used free Avast security for our computers for years (we all use Apple products too), so signed up for their VPN service – less than $50/year. The free WiFi here at the resort is inconsistent at best, but so far the VPN has been working well. I admire your patience and meticulous documentation with the landlord. Regardless what happens with your deposit, your work will “pay off.” So happy you are enjoying the condo! It has taken a LOT of patience to deal with this man, and we still have no idea how things are going to go. We have lots of evidence though if we do take him to court: photos, texts, witnesses, and more. The condo is better than we imagined – we are really enjoying our stay here. Dark chocolate for me but my mother agrees with you about milk chocolate. Brett and three out of four of our children prefer dark chocolate – Meiling likes milk chocolate too. I’m looking forward to trying chocolates when we’re in Europe! That landlord! Ugh! I am sure, you will be fine if you take him to court. I love hot tubs and my American friend whom I shall be visiting soon in the US has one. I am looking forward to soaking in it. Good luck to YaYu with the wisdom teeth. Hope, she recovers fast and with minimum pain possible. Dark chocolate for me please too! I like the 70% Lindt best. YaYu just got home from the oral surgeon a few minutes ago – she’s a bit swollen and sore, but otherwise OK (for now) and went right to sleep. Our fingers are crossed that her recovery goes well. The landlord is a real piece of work. We caught him in many contradictions and several lies last week, but we have a record of everything if we need it. It appears to me that your landlord thrives on the drama, so were it me I’d move directly to small claims court and tell him to prepare to do same. Good luck with whatever you decide, though, and sincerely hope you are able to resolve and move on soon! Your comments about noise wearing over time are so spot on. We backed up to an increasingly noisy street at our last home, and it wasn’t till we moved to our current very quiet location that I realized how disruptive the noise had grown to become. Sitting out back these days in our peaceful backyard watching birds and the occasional hawk fly by is absolutely wonderful. Even after being here a year, I continue to relish the peace, so I understand exactly what you are now experiencing. Brett says the landlord is the biggest B.S.er that he’s ever met (and in the navy you meet a lot! ), and in the short time we have known him has told so many stories/lies that he can’t keep them straight any more. He is also one of those people who can never be wrong, only wronged. In other words, everything is someone else’s fault. By law he has to have our deposit at least in the mail by August 14, so Brett will be contacting him once more on that date to find out the status of our deposit. We have a year to take him to small claims, so if it comes to that I will come back here next spring. Brett has always been the one to deal with him (I refused to because I have very little patience for his type), but I will be the one in court if it comes to that – I am not easily ruffled, and I’ve found it throws men like him off when they have to argue/discuss anything with a woman (which is unfortunate in this day and age, but still true). The noise in our old neighborhood was constant. If it wasn’t chickens and roosters screaming it was dogs barking or noisy neighbors or loud music or cars or saws or weed trimmers – something was almost always making a lot of noise, and of course we had to keep the windows open all the time. I thought I had adjusted to it all but apparently not – I’ve been sleeping so much better since we moved over here to the condo and feel so much better each day because I’m truly rested. I do love me some dark chocolate, but I makes blueberry scones with vanilla flavored white chocolate chips and they are amazing. My big accomplishment this week was re-retiring!!! I had been work a part-time job (3 days/week @ 5 hours/day) but decided it was time to play more! This retirement was so different than the first one 4 years ago since back then my husband was killed and my life was in such a turmoil that I couldn’t work and took the early retirement. This time, it was MY choice and on MY terms. Such a boost for me mentally!!! Congratulations on your re-retirement. It sound like your first go with was under duress, so to speak and you really just weren’t ready. But, with some time under your belt and time to think about it all for a while, now is the right time. Enjoy! For us, retirement has been every bit as wonderful as we thought it would be, but we did our way and on our schedule. We spent yesterday organizing all the landlord’s messages into something coherent, which was difficult because he really was all over the place. But, he very clearly either incriminates himself OR contradicts himself, over and over and over. Anyway, we’re more than ready if we end up taking him to small claims. Blueberry scones with vanilla chips sound amazing. I’m tucking this knowledge away for future use.